The US received a major blow to its global hegemony, and one which is sure to trigger more fighting talk from hawks in Washington. 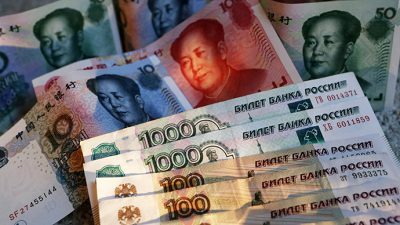 This week it was announced that China has established a ‘payment versus payment‘ (PVP) system to clear Chinese yuan and Russian ruble transactions. The aim, we’re told, is to to “reduce risks and improve the efficiency” of its foreign exchange system. The new mechanism, which could rival the long-held monopoly of the US SWIFT inter-bank payment system (allowing for simultaneous settlement of transactions in two different currencies) was launched on Monday after receiving approval from China’s central bank, according to a statement by the country’s foreign exchange trading system. Since petrodollars and petrodollar surpluses are by definition denominated in U.S. dollars, then purchasing power is dependent on the U.S. rate of inflation and the rate at which the U.S. dollar is exchanged (whenever there is need for convertibility) by other currencies in international money markets. It follows that whenever economic or other factors affect the U.S. dollar, petrodollars will be affected to the same magnitude. The link, therefore, between the U.S. dollar and petrodollar surpluses, in particular, has significant economic, political, and other implications. First, the placement of petrodollar surpluses of the Arab oil exporting nations in the United States may be regarded politically as hostage capital. In the event of a major political conflict between the United States and an Arab oil-exporting nation, the former with all its military power can confiscate or freeze these assets or otherwise limit their use. This breaking development coincides with other recent moves, including news that China will “compel” Saudi Arabia to trade oil in yuan. If this happens, the rest of the global oil market could follow suit, which would spell catastrophe for the U.S. dollar as the world’s reserve currency. Yuan pricing of oil is coming, economist says from CNBC. These two stories are absolutely linked. This is full-frontal challenge to the Anglo-American World Order. Russia and China are also working behind the scenes to shore-up their precious metal/gold trading standards, possibly in preparation of a new ‘gold-backed’ currency valuation initiative. CFETS said it plans to introduce PVP systems for yuan transactions with other currencies based on China’s Belt and Road initiative, and complying with the process of renminbi [Yuan] internationalization. Russia, however, is a top priority: the world’s biggest oil producer recently became the largest source of oil for China, the world’s top energy consumer. To be sure, the monetary convergence between Beijing and Moscow is hardly new. The most notable recent development took place in April, when the Russian central bank opened its first overseas office in Beijing on March 14, marking a step forward in forging a Beijing-Moscow alliance to bypass the US dollar in the global monetary system, and to phase-in a gold-backed standard of trade. As the South China Morning Post reported at the time, the new office was part of agreements made between the two neighbours “to seek stronger economic ties” since the West brought in sanctions against Russia over the Ukraine crisis and the oil-price slump hit the Russian economy. Expect that the West not to take this major financial challenge by China and Russia lying down. Washington may use its North Korea, Myanmar or Philippines cards – as a means to increase its leverage in Asia, in an effort to extract Chinese concessions, and head-off China’s new financial ascendancy.